What killed off the Neanderthals? It's a big debate, and now a study says that no matter what the answer, they were doomed anyway. The new study isn't intended to argue against those factors, but just to show that they're not needed to explain the extinction, says Oren Kolodny of Stanford University. Neither species was assumed to have any inherent advantage, but there was one crucial difference: Unlike the Neanderthals, the modern humans were supplemented by reinforcements coming in from Africa. It wasn't a huge wave, but rather "a tiny, tiny trickle of small bands," Kolodny said. If survival was a game of chance, "it was rigged by the fact that there's recurring migration," Kolodny said. "The game was doomed to end with the Neanderthals losing." 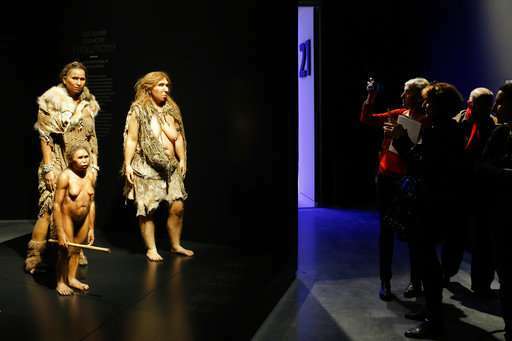 Experts in human origins said the paper could help scientists pin down the various factors that led to the Neanderthals' demise. It fits in with other recent attempts to explain the extinction without assuming behavioral differences between Neanderthals and our ancestors, said Wil Roebroeks of the University of Leiden in the Netherlands. The notion of such differences is largely disproven, he said. Katerina Harvati of the University of Tuebingen in Germany said while the new work could be useful in solving the extinction mystery, it doesn't address the question of why modern humans dispersed from Africa into Europe and Asia. It's important to figure out what was behind that, she said in an email. It's most likely that this "extinction" took the form of the two subspecies combining. Current Human genetics contain Neanderthal genes, with the exception of those human groups that did not have contact with them. The Neanderthal genotype simply ceased to exist as a separate genotype over time. evidence does indeed point to the Neanderthals being fully absorbed into the Homo sapiens sapiens population. I, for one, like my Neanderthal ancestors, bigger brains they had and better cold addaption.